Big Surf for NJ last weekend and I had an experience I'll never forget.....Sunday (yesterday)about 730 am...morning glass....outside break about 200 yards offshore...me and about about 10 others noticed a big set to our south, about 50 yards...huge right peeling off and all of a sudden dolphins are jumping out of the curl surfing the wave. We all hooted and hollered but I still turned to the guy next to me to see if he saw what I saw. About 5 minutes later a big set was coming in right at us. I was in postion so I turned to paddle. Glancing back at the wave as it approached I was awestruck to see two dolphins in the wave surfing it as it approached me...they were not jumping out, but they were in the wave heading right for me. Jittery but undetered I paddled and caught the wave heading backside right....clean 8footer lined up and I was mindful to look around for the dophin...but I did not see them. It was a real nice wave and I had many great rides...but what will stand out to me for years to come were those dolphin. 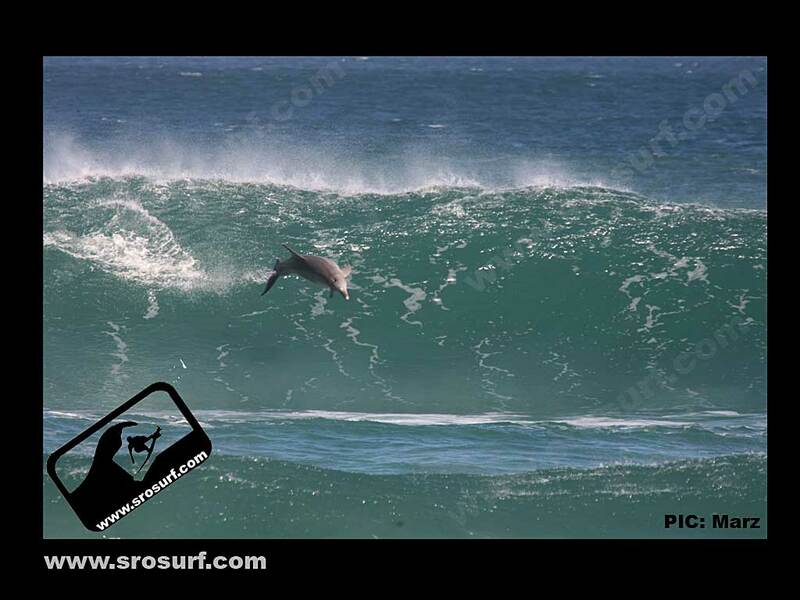 I have been surfing over 35 years and never saw dolphin surfing in person before. I have seen video's, but the personal up close experience was quite the eye opener. More surf is on the way for this weekend also. Hurricaine Earl . Hopefully my "spaghetti arms" will recover by then. 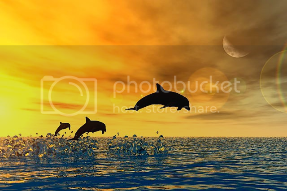 I've seem dolphins swimming up and down the coast for a long time. Once a little guy jumped out of the water about 20 twenty or so yards away.....but I never saw them surfing before. Get out there Mur - it's now or never. Tomorrow afternoon seems to be best. 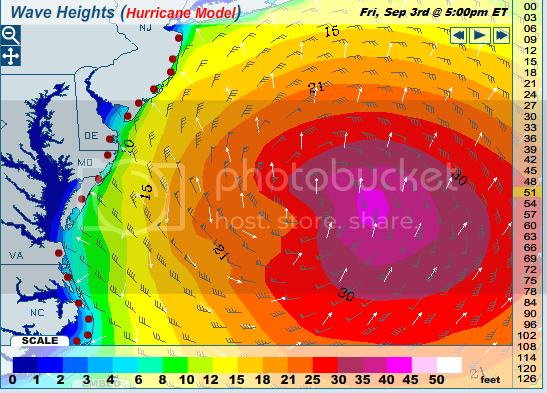 The wind will switch west offshore hard and cleanup the monster chop. Potentially the biggest waves I've ever surfed. But you never know what it will be like till you get there. murnut wrote: Potentially the biggest waves I've ever surfed. Just be careful, Andy. And I know I don't have to tell you to buddy-up for the big waves. My story: Back in 1991 I was surfing a hurricane induced swell here in Huntington Beach. Biggest waves I had ever surfed. And the water was a LOT warmer than it is typically around here. So I did not even wear a shorty suit, which would have improved my buoyancy. I went out in shorts. As luck would have it, while duck-diving under a pretty massive wave, my board broke, smacked me in the face, and tumbled me. I was pretty disoriented, and my hand barely broke through the surface as I was running out of air...felt the early stages of passing out. I wasn't buddied-up, and I was outside the massive breaks! I was lucky that I was able to tread for awhile, and a younger kid came by, saw I didn't have a suit on, and so gave me his board and he swam in. Yeah...I have some near misses like that, but I never broke a board, although once while paddling out at Manasquan I got hit by a massive lip and I was shocked my board did not break. Also, about 5 years ago there was some really big fairly rough surf, but it was breaking really far out....and I never cleared the inside after paddling about 30 minutes....and I came quite close to a jetty. I still don't know how I managed to avoid it. I was alone and no one else was around. My motto is now..."When in doubt, don't paddle out"
What better reality to uncover than surfing. Way to go Andy. Heading out this weekend with our niece for a lesson. Hoping that we don't encounter anything over 3 ft. Have a great holiday weekend. I was teaching my sons all summer although the oldest does not really want his old man helping him. Hey Mir good luck with the big ones. When I lived in NC we always headed for Kill Devil Hills to catch the caners(our slang for waves induced by hurricanes) man that was some awesome surf. Way better than the puny things they call waves here on the left coast of Florida. Man to be back at the Maverics. Enjoy my man.